Bladder cancer is the most common carcinoma of the urinary system. Early detection and diagnosis of bladder cancer is a major challenge. Urine cytology has low sensitivity and specificity, especially for low-grade tumors. Cystoscopy is the gold standard for the detection and follow-up of bladder tumors. However, it is an expensive and invasive procedure and can fail to detect many bladder lesions such as carcinoma in situ (CIS). It is thus an unmet need to identify a robust set of biomarkers, which can improve the current diagnostic practice. During the last one decade, several bladder tumor markers have been identified for diagnosis, however, none of these diagnostic markers offer sufficient sensitivity and specificity to be routinely used in the clinics. Recent advancement in mass spectrometry (MS)-based quantitative proteomics has emerged as a powerful method to discover wide range of proteins in complex biological samples. In this review, we summarize the status of biomarkers currently identified and used for bladder cancer diagnosis. Bladder cancer is the second most common genitourinary tract cancer worldwide and it results in significant morbidity and mortality 1, 2. These tumors have a range of manifestations. The papillary tumors are mostly well differentiated as flat tumors and the higher grade tumors are poorly differentiated and highly aggressive. Bladder carcinoma is divided into two clinicopathological subtypes namely; non-muscle invasive bladder cancer (NMIBC) and muscle-invasive bladder cancer (MIBC). Majority of the transitional cell carcinomas are NMIBCs (70% – 75%) while approximately 25% – 30% cases are MIBCs at diagnosis 3. Carcinoma in situ (CIS) of the bladder are higher grade non-papillary; non-invasive tumors, which harbor increased risk of progression to muscle-invasive stages as well as recurrence 4, 5. The NMIBCs are treated by Transurethral Resection of Bladder Tumor (TURBT) at diagnosis 6. However, 50% of these patients have recurrence with a short period of approximately 12 months 7. Radical cystectomy has been the choice of treatment for MIBCs since decades 8. The overall 5-year survival of patients is relatively high in superficial bladder carcinoma, however, most of these patients (40% – 80%) will progress to higher stages or recur 9. In the case of high grade MIBCs, once the cancer progresses to metastatic stages, the overall 5-year survival decreases radically to only 6% 10. Diagnosis of bladder carcinoma has not evolved considerably in the past decades. Cystoscopy remains to be the major modality for bladder carcinoma diagnosis as well as follow-up 11, 12. However, it is a highly invasive procedure. Thus, owing to high recurrence rate and the frequent need for follow-up implies a very high financial burden on individual and families. Cytological examinations is another additive approach of diagnosis; however its major limitation being poor sensitivity especially for low-grade tumors. Developing cost-effective as well as non-invasive strategies to advance the detection of bladder tumors is the main focus of biomarker discovery. Researchers have long attempted to identify urinary biomarkers for the detection of bladder carcinoma as a potential alternative to cystoscopy 13. Urinary biomarkers, in particular may be a helpful diagnostic adjunct in bladder cancer, as urine-based diagnostic tests will offer a non-invasive and cost-effective means of detection of carcinoma. With the growth in unbiased profiling techniques (genomics, transcriptomics, proteomics and metabolomics profiling), the data-driven discovery of novel biomarkers has recently gained momentum. The current approaches employed for the early detection of bladder cancer are depicted in Figure 1. In this article, we summarized the challenges and the recent development in the area of bladder biomarker discovery. In this era of proteomics, the discovery of reliable, sensitive and specific biomarkers is beaming to gain momentum for the better understanding of cancer pathobiology. Mass-spectrometry is a reliable method for the unbiased identification and absolute quantification of proteins, which is thus emerging as an alternative to the immunoassays such as ELISA. The proteomic profiling of body fluids such as urine and identifying biomarkers with potential clinical utility in non-invasive assays could be an excellent approach for bladder cancer diagnosis. The establishment of a normal urinary proteome has evolved hand-in-hand with the improvement of proteomic techniques. In a study by Thongboonkerd et al., studies exploited LC-MS/MS and identified over 100 proteins from unfractionated normal urine 14. In another multicentre study were the researchers have identified proteins panel such as fibrinogen chains, apolipoprotein A1 (ApoA-1), beta-2-macroglobulin and basement membrane-specific heparan sulfate proteoglycan 15. The findings from urine proteomics were further verified at the tissue level in several studies 16, 17, 18. Based on the urine proteome studies, the secretome of the tumor cell lines were also utilized. Association of TACSTD2 with bladder cancer has been investigated and highlighted the prospective of non-invasive bladder cancer diagnosis using human urinary microparticle 19. Plasma proteomics studies have also been conducted on bladder cancer patients, however, are comparatively lagging as compared to urine proteomics. Altered expression of S100A4, S100A8, S100A9, carbonic anhydrase I (CA I) and annexin V proteins in pre-operative bladder cancer serum compared to healthy controls were observed. Further it was validated on the follow-up post-operative patients that S100A4, S100A8, S100A9, carbonic anhydrase I (CA I) were significantly reduced while annexin V was progressively increased 20. Highly specific and sensitive biomarkers for the prediction of clinical course of the patient during and after receiving therapy or treatment are immensely requisite. In previous studies, survivin, fascin, MCT1, MCT4 and CD147 were observed to be associated to bladder carcinoma development and progression 21, 22, 23. Recently, in a meta-analysis of twenty-four studies on CD147 expression revealed that its expression in bladder carcinoma patients was significantly higher than in non-cancer tissues. CD147 expression was found to be closely associated with prognostic and clinicopathological characteristics and response to chemotherapy 24. In a study from urine samples, the prognostic value of matrix metalloproteinase-9 (MMP-9) was evaluated where MMP-9 was measured in urine from bladder carcinoma patients and was suggested as an independent prognostic marker of poor survival 25. In another study, nicotinamide N-methyltransferase (NNMT) expression was evaluated in urine samples of 55 bladder carcinoma patients. The data revealed that NNMT could be used to diagnose the early NMIBCs through urine-based tests. In another meta-analysis, it was suggested that HA/HAase could be used as a biomarker for the diagnosis of bladder carcinoma 26. Fast-track diagnosis of bladder carcinoma in a non-invasive approach has utilized urinary markers for affirmative use as they contain proteins of malignant exfoliated cells from the primary tumors. Several other single protein biomarkers like alpha-1-anti trypsin (SERPINA1), apolipoprotein A1 (APOA1), transforming growth factor-beta-induced protein IG-H3 (BIGH3), keratin, type I cytoskeletal 19 (CYFRA 21-1), protein/nucleic acid deglycase DJ-1 (DJ1), stathmin-1 (STMN1) and telomerase (TERT) have been proposed for the detection of bladder carcinomas [27-33] 27. In addition, microRNAs have been implicated as potential biomarkers in tumor initiation, regulation and progression 34, 35. The miR-182/miR-100 ratio has been studied to serve as a biomarker for bladder carcinoma diagnosis and survival prediction 36. In a panel study of miRNAs, six-miRNAs (miR-152, miR-148b-3p, miR-3187-3p, miR-15b-5p, miR-27a-3p and miR-30a-5p) were considered as a serum signature for bladder carcinoma diagnosis with high sensitivity (sensitivity and specificity of 90%) 37. miR-126 and miR-96 were also reported to be potential diagnostic markers in bladder carcinoma 38, 39. Among the FDA approved urine based tests, bladder tumor antigens (BTA stat® Test; Bion Diagnostic Sciences, Redmond, Washington, USA) has been reported to be a simple and rapid immune chromatographic test that detects bladder tumors in human urine 40. Low-specificity of the BTA tests is associated with benign genitourinary conditions as well as intravesicle BCG treatment 41. Moreover, false-positive results of NMP22 in patients followed-up (for a mean range of approximately 28 months) for bladder carcinoma correlate with future recurrences 42. UBC tests in combination with bladder washing cytology revealed higher sensitivity in detecting low- and high-grade tumors but at the expense of a lower specificity as compared to urine cytology. Thus, currently cystoscopy cannot be replaced by any of the evaluated methods 43. A widespread approach based on multiplex biomarker panel offers accurate and sensitive detection and diagnosis of bladder cancer patients. In a study by Kumar et al., a robust set of urine biomarkers for bladder cancer detection was identified. The study employed mass spectrometry-based quantitative proteomics approach to identify a panel of potential biomarkers: Coronin-1A, Apolipoprotein A4, Semenogelin-2, Gamma synuclein and DJ-1/PARK7. A multi-analyte assay was established for both non-muscle invasive (Ta/T1) and muscle invasive (T2/T3) bladder cancer detection in urine using MS-based stable isotope labelling approach for the biomarkers discovery. These biomarkers panels were validated in a large cohort of urine samples from 66 healthy subjects, 110 NMIBC (Ta/T1) patients and 63 MIBC (T2/T3) patients using RT-PCR, western blot and ELISA. In the western blot based validation, all the bladder carcinoma patients displayed elevated expression of at least three out of the five biomarkers. This panel achieved an AUC 0.92 and 0.98 respectively using ELISA and western blot data (79.2% and 93.9% sensitivity; 100% and 96.7% specificity). This panel also involves the potential for follow-up of patients and screening asymptomatic subject at high-risk of developing bladder carcinoma. Moreover, these five biomarkers are also able to differentiate between bladder carcinoma patients and patients with different benign conditions such as; inflammation of the bladder, benign prostrate hyperplasia or nephrolithiasis perhaps associated with hematuria 44. Escalating the understanding of the proteomic landscape of bladder carcinoma anticipates the discoveries of new proteomic biomarkers for bladder cancer detection and surveillance. Additionally, it has improved the usefulness and accuracy of diagnostic and prognostic significance in the prediction of cancer progression. However, large cohorts of patient’s biological samples and complete clinical annotation are required for validation. This remains a major challenge for the biomarkers discovery and validation. Tumor heterogeneity does not allow the use of single biomarker; hence multiplex biomarker panel will offer high accuracy for the diagnosis of bladder cancer patients. In addition, multiple protein signatures may target tumor heterogeneity and offer a better prospect for non-invasive detection of bladder cancer. PK is a recipient of the Ramanujan Fellowship awarded by Department of Science and Technology (DST), Government of India. BD is a recipient of INSPIRE Fellowship from Department of Science and Technology (DST), Government of India. L.A. Torre, F. Bray, R.L. Siegel, J. Ferlay, J. Lortet-Tieulent, A. Jemal, Global cancer statistics, 2012, CA: a cancer journal for clinicians, 65 (2015) 87-108. R.L. Siegel, K.D. Miller, A. Jemal, Cancer Statistics, 2017, CA: a cancer journal for clinicians, 67 (2017) 7-30. F. Zhao, Y.Z. Ge, L.H. Zhou, L.W. Xu, Z. Xu, W.W. Ping, M. Wang, C.C. Zhou, R. Wu, R.P. Jia, Identification of hub miRNA biomarkers for bladder cancer by weighted gene coexpression network analysis, OncoTargets and therapy, 10 (2017) 5551-5559. D.H. Tang, S.S. Chang, Management of carcinoma in situ of the bladder: best practice and recent developments, Therapeutic advances in urology, 7 (2015) 351-364. J.A. Witjes, Bladder carcinoma in situ in 2003: state of the art, European urology, 45 (2004) 142-146. M. Babjuk, A. Bohle, M. Burger, O. Capoun, D. Cohen, E.M. Comperat, V. Hernandez, E. Kaasinen, J. Palou, M. Roupret, B.W. van Rhijn, S.F. Shariat, V. Soukup, R.J. Sylvester, R. Zigeuner, EAU Guidelines on Non-Muscle-invasive Urothelial Carcinoma of the Bladder: Update 2016, European urology, 71 (2017) 447-461. B.S. Tae, C.W. Jeong, C. Kwak, H.H. Kim, K.C. Moon, J.H. Ku, Pathology in repeated transurethral resection of a bladder tumor as a risk factor for prognosis of high-risk non-muscle-invasive bladder cancer, PloS one, 12 (2017) e0189354. F.A. Yafi, W. Kassouf, Radical cystectomy is the treatment of choice for invasive bladder cancer, Canadian Urological Association journal. Journal de l'Association des urologues du Canada, 3 (2009) 409-412. P.U. Malmstrom, S. Agrawal, M. Blackberg, P.J. Bostrom, B. Malavaud, D. Zaak, G.G. Hermann, Non-muscle-invasive bladder cancer: a vision for the future, Scandinavian journal of urology, 51 (2017) 87-94. A. Salama, A.M. Abdelmaksoud, A. Shawki, A. Abdelbary, H. Aboulkassem, Outcome of Muscle-Invasive Urothelial Bladder Cancer After Radical Cystectomy, Clinical genitourinary cancer, 14 (2016) e43-47. J. Bellmunt, A. Orsola, J.J. Leow, T. Wiegel, M. De Santis, A. Horwich, Bladder cancer: ESMO Practice Guidelines for diagnosis, treatment and follow-up, Annals of oncology : official journal of the European Society for Medical Oncology, 25 Suppl 3 (2014) iii40-48. S.J. Maclennan, M. Imamura, M.I. Omar, L. Vale, T. Lam, P. Royle, J. Royle, S. Swami, R. Pickard, S. McClinton, T.R. Griffiths, P. Dahm, J. N'Dow, Urological cancer care pathways: development and use in the context of systematic reviews and clinical practice guidelines, World journal of urology, 29 (2011) 291-301. C.J. Rosser, V. Urquidi, S. Goodison, Urinary biomarkers of bladder cancer: an update and future perspectives, Biomarkers in medicine, 7 (2013) 779-790. V. Thongboonkerd, K.R. McLeish, J.M. Arthur, J.B. Klein, Proteomic analysis of normal human urinary proteins isolated by acetone precipitation or ultracentrifugation, Kidney international, 62 (2002) 1461-1469. M. Frantzi, K.E. van Kessel, E.C. Zwarthoff, M. Marquez, M. Rava, N. Malats, A.S. Merseburger, I. Katafigiotis, K. Stravodimos, W. Mullen, J. Zoidakis, M. Makridakis, M. Pejchinovski, E. Critselis, R. Lichtinghagen, K. Brand, M. Dakna, M.G. Roubelakis, D. Theodorescu, A. Vlahou, H. Mischak, N.P. Anagnou, Development and Validation of Urine-based Peptide Biomarker Panels for Detecting Bladder Cancer in a Multi-center Study, Clinical cancer research : an official journal of the American Association for Cancer Research, 22 (2016) 4077-4086. J. Zoidakis, M. Makridakis, P.G. Zerefos, V. Bitsika, S. Esteban, M. Frantzi, K. Stravodimos, N.P. Anagnou, M.G. Roubelakis, M. Sanchez-Carbayo, A. Vlahou, Profilin 1 is a potential biomarker for bladder cancer aggressiveness, Molecular & cellular proteomics : MCP, 11 (2012) M111 009449. M. Frantzi, J. Zoidakis, T. Papadopoulos, P. Zurbig, I. Katafigiotis, K. Stravodimos, A. Lazaris, I. Giannopoulou, A. Ploumidis, H. Mischak, W. Mullen, A. Vlahou, IMAC fractionation in combination with LC-MS reveals H2B and NIF-1 peptides as potential bladder cancer biomarkers, Journal of proteome research, 12 (2013) 3969-3979. J.P. Tolson, T. Flad, V. Gnau, H. Dihazi, J. Hennenlotter, A. Beck, G.A. Mueller, M. Kuczyk, C.A. Mueller, Differential detection of S100A8 in transitional cell carcinoma of the bladder by pair wise tissue proteomic and immunohistochemical analysis, Proteomics, 6 (2006) 697-708. C.L. Chen, Y.F. Lai, P. Tang, K.Y. Chien, J.S. Yu, C.H. Tsai, H.W. Chen, C.C. Wu, T. Chung, C.W. Hsu, C.D. Chen, Y.S. Chang, P.L. Chang, Y.T. Chen, Comparative and targeted proteomic analyses of urinary microparticles from bladder cancer and hernia patients, Journal of proteome research, 11 (2012) 5611-5629. N. Bansal, A.K. Gupta, A. Gupta, S.N. Sankhwar, A.A. Mahdi, Serum-based protein biomarkers of bladder cancer: A pre- and post-operative evaluation, Journal of pharmaceutical and biomedical analysis, 124 (2016) 22-25. J. Bi, X. Chen, Y. Zhang, B. Li, J. Sun, H. Shen, C. Kong, Fascin is a predictor for invasiveness and recurrence of urothelial carcinoma of bladder, Urologic oncology, 30 (2012) 688-694. S.F. Shariat, R. Ashfaq, P.I. Karakiewicz, O. Saeedi, A.I. Sagalowsky, Y. Lotan, Survivin expression is associated with bladder cancer presence, stage, progression, and mortality, Cancer, 109 (2007) 1106-1113. J.W. Choi, Y. Kim, J.H. Lee, Y.S. Kim, Prognostic significance of lactate/proton symporters MCT1, MCT4, and their chaperone CD147 expressions in urothelial carcinoma of the bladder, Urology, 84 (2014) 245 e249-215. H. Li, Y. Xu, CD147 as a novel biomarker for predicting the prognosis and clinicopathological features of bladder cancer: a meta-analysis, Oncotarget, 8 (2017) 62573-62588. B.V. Offersen, M.M. Knap, M.R. Horsman, J. Verheijen, R. Hanemaaijer, J. Overgaard, Matrix metalloproteinase-9 measured in urine from bladder cancer patients is an independent prognostic marker of poor survival, Acta Oncol, 49 (2010) 1283-1287. V. Pozzi, G. Di Ruscio, D. Sartini, R. Campagna, R. Seta, P. Fulvi, A. Vici, G. Milanese, G. Brandoni, A.B. Galosi, R. Montironi, M. Cecati, M. Emanuelli, Clinical performance and utility of a NNMT-based urine test for bladder cancer, The International journal of biological markers, (2017) 0. N. Yang, S. Feng, K. Shedden, X. Xie, Y. Liu, C.J. Rosser, D.M. Lubman, S. Goodison, Urinary glycoprotein biomarker discovery for bladder cancer detection using LC/MS-MS and label-free quantification, Clinical cancer research : an official journal of the American Association for Cancer Research, 17 (2011) 3349-3359. M. Miyake, S. Ross, A. Lawton, M. Chang, Y. Dai, L. Mengual, A. Alcaraz, E.G. Giacoia, S. Goodison, C.J. Rosser, Investigation of CCL18 and A1AT as potential urinary biomarkers for bladder cancer detection, BMC urology, 13 (2013) 42. Y.T. Chen, C.L. Chen, H.W. Chen, T. Chung, C.C. Wu, C.D. Chen, C.W. Hsu, M.C. Chen, K.H. Tsui, P.L. Chang, Y.S. Chang, J.S. Yu, Discovery of novel bladder cancer biomarkers by comparative urine proteomics using iTRAQ technology, Journal of proteome research, 9 (2010) 5803-5815. D. Bhagirath, N. Abrol, R. Khan, M. Sharma, A. Seth, A. Sharma, Expression of CD147, BIGH3 and Stathmin and their potential role as diagnostic marker in patients with urothelial carcinoma of the bladder, Clinica chimica acta; international journal of clinical chemistry, 413 (2012) 1641-1646. B. Nisman, V. Barak, A. Shapiro, D. Golijanin, T. Peretz, D. Pode, Evaluation of urine CYFRA 21-1 for the detection of primary and recurrent bladder carcinoma, Cancer, 94 (2002) 2914-2922. M. Sanchez-Carbayo, A. Espasa, V. Chinchilla, E. Herrero, J. Megias, A. Mira, F. Soria, New electrochemiluminescent immunoassay for the determination of CYFRA 21-1: analytical evaluation and clinical diagnostic performance in urine samples of patients with bladder cancer, Clinical chemistry, 45 (1999) 1944-1953. S. Eissa, R.A. Labib, M.S. Mourad, K. Kamel, O. El-Ahmady, Comparison of telomerase activity and matrix metalloproteinase-9 in voided urine and bladder wash samples as a useful diagnostic tool for bladder cancer, European urology, 44 (2003) 687-694. H. Liu, MicroRNAs in breast cancer initiation and progression, Cellular and molecular life sciences : CMLS, 69 (2012). 3587-3599. S.P. Nana-Sinkam, C.M. Croce, MicroRNA regulation of tumorigenesis, cancer progression and interpatient heterogeneity: towards clinical use, Genome biology, 15 (2014) 445. Z. Chen, L. Wu, Q. Lin, J. Shi, X. Lin, L. Shi, Evaluation of miR-182/miR-100 Ratio for Diagnosis and Survival Prediction in Bladder Cancer, Archives of Iranian medicine, 19 (2016) 645-651. 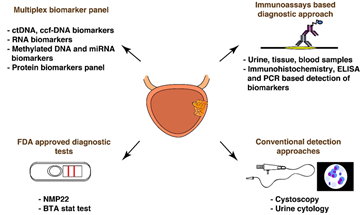 X. Jiang, L. Du, L. Wang, J. Li, Y. Liu, G. Zheng, A. Qu, X. Zhang, H. Pan, Y. Yang, C. Wang, Serum microRNA expression signatures identified from genome-wide microRNA profiling serve as novel noninvasive biomarkers for diagnosis and recurrence of bladder cancer, International journal of cancer, 136 (2015) 854-862. M. Hanke, K. Hoefig, H. Merz, A.C. Feller, I. Kausch, D. Jocham, J.M. Warnecke, G. Sczakiel, A robust methodology to study urine microRNA as tumor marker: microRNA-126 and microRNA-182 are related to urinary bladder cancer, Urologic oncology, 28 (2010) 655-661. Y. Yamada, H. Enokida, S. Kojima, K. Kawakami, T. Chiyomaru, S. Tatarano, H. Yoshino, K. Kawahara, K. Nishiyama, N. Seki, M. Nakagawa, MiR-96 and miR-183 detection in urine serve as potential tumor markers of urothelial carcinoma: correlation with stage and grade, and comparison with urinary cytology, Cancer science, 102 (2011). 522-529. M.F. Sarosdy, The use of the BTA Test in the detection of persistent or recurrent transitional-cell cancer of the bladder, World journal of urology, 15 (1997) 103-106. D. Pode, A. Shapiro, M. Wald, O. Nativ, M. Laufer, I. Kaver, Noninvasive detection of bladder cancer with the BTA stat test, The Journal of urology, 161 (1999) 443-446. V. Poulakis, U. Witzsch, R. De Vries, H.M. Altmannsberger, M.J. Manyak, E. Becht, A comparison of urinary nuclear matrix protein-22 and bladder tumour antigen tests with voided urinary cytology in detecting and following bladder cancer: the prognostic value of false-positive results, BJU international, 88 (2001). 692-701. R. Pichler, G. Tulchiner, J. Fritz, G. Schaefer, W. Horninger, I. Heidegger, Urinary UBC Rapid and NMP22 Test for Bladder Cancer Surveillance in Comparison to Urinary Cytology: Results from a Prospective Single-Center Study, International journal of medical sciences, 14 (2017) 811-819. P. Kumar, S. Nandi, T.Z. Tan, S.G. Ler, K.S. Chia, W.Y. Lim, Z. Butow, D. Vordos, A. De la Taille, M. Al-Haddawi, M. Raida, B. Beyer, E. Ricci, M. Colombel, T.W. Chong, E. Chiong, R. Soo, M.K. Park, H.K. Ha, J. Gunaratne, J.P. Thiery, Highly sensitive and specific novel biomarkers for the diagnosis of transitional bladder carcinoma, Oncotarget, 6 (2015) 13539-13549. Deb, Barnali, and Prashant Kumar. "Biomarkers for Bladder Cancer: Present Challenges and Recent Developments." Journal of Cancer Research and Treatment 6.2 (2018): 34-38. Deb, B. , & Kumar, P. (2018). Biomarkers for Bladder Cancer: Present Challenges and Recent Developments. Journal of Cancer Research and Treatment, 6(2), 34-38. Deb, Barnali, and Prashant Kumar. "Biomarkers for Bladder Cancer: Present Challenges and Recent Developments." Journal of Cancer Research and Treatment 6, no. 2 (2018): 34-38.